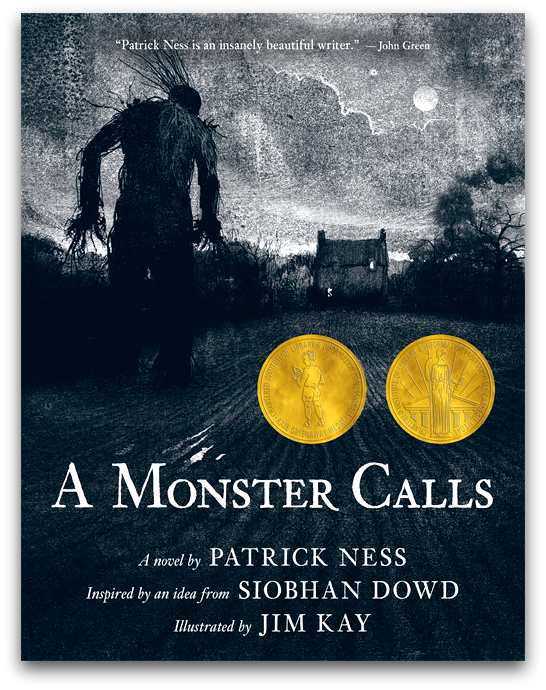 My daughter was settled in at the foot of my bed playing on her iPhone and I was reading the last few pages of Patrick Ness’s remarkable novel, A Monster Calls. And, yeah, I was crying. Hard by the end of it. A Monster Calls is the story of thirteen-year-old Conor O’Malley who lives with his mom in a little house in a little town in England. His parents are divorced and his dad now lives in the States with his new wife and a baby daughter. Conor rarely sees him. The monster continues to visit at night with stories that make no sense to Conor. The monster also claims that there will come a time for the fourth tale – that is Conor’s story. Conor knows what the monster is talking about: a recurring nightmare which terrifies him and which he insists he will not be sharing. In the meantime, his mother grows weaker, his grandmother steps in to help out (much to Conor’s dismay) and his father visits from America – a sure sign of the Apocalypse. Conor’s truth is one that he is unwilling to face, but which comes barrelling towards him anyway. And as a reader, I have to say, I was unprepared for its impact. A Monster Calls reminded me a little bit of John Connolly’s brilliant novel The Book of Lost Things. Connolly’s story is also about a boy on a journey from innocence to experience. You should definitely check it out. As for A Monster Calls – I cannot recommend it highly enough. This entry was posted in Book Chat and tagged 2013, Book Review, favourite authors, favourite books, highly recommended, prize winner, YA by Christie. Bookmark the permalink.